Hip arthroplasty (also known as a hip replacement surgery) is one of the most common joint surgeries performed every year. When the hip joint wears down, it can cause a lot of pain, weakness, and loss of quality of life. Doctors treat hip joint pain in a variety of ways, including with painkillers (both over-the-counter and prescription drugs), physical therapy, regenerative medicine techniques, and more. However, when all of these treatment options do not work or are not viable solutions to a patient’s hip pain, doctors often recommend hip arthroplasty as a solution. Hip arthroplasty is a surgical procedure that involves inserting an artificial part called a prosthesis in the hip when the hip joint no longer function as intended. What Does Hip Arthroplasty Treat? Wear and Tear – A common cause for hip pain is simply years of wear and tear on the hip joint. Our bodies are designed to wear down gradually as we age, so many people in their 60s and older may experience hip pain just from years and years of using the hip. Osteoarthritis – Osteoarthritis is a disease that causes cartilage to break down between bones. This can affect any joint in the body, including the hip, knee, elbow, and shoulder. Patients with osteoarthritis have a high risk of experiencing hip pain and may require a hip arthroplasty to alleviate their symptoms. Injury – Blunt force impact or trauma is another common cause for hip pain and fractures. When the hip breaks or is damaged beyond repair, a hip arthroplasty may be a viable solution to fix the problem. Rheumatoid Arthritis – Rheumatoid arthritis is a disease that causes the body’s immune system to attack joints in the body. It can affect any joint in the body, including the hip. Has a High Success Rate – Hip arthroplasty is one of the safest and most successful surgical procedures performed. It’s a very common procedure that’s been performed for decades. Because it is a safe, effective, and a time-tested procedure, you don’t have to worry about it being risky. Addresses Root Cause of the Problem – Hip pain is caused by a worn-out hip joint. Treatment methods like pain relievers, physical therapy, etc., do not treat the actual issue – they merely relieve a patient’s symptoms. Hip arthroplasty strives to fix the root problem itself to prevent symptoms from occurring in the first place. Offers Successful Pain Relief – Hip arthroplasty offers effective results such as pain relief not achievable for many with other treatment methods. Some medications and other treatments simply cannot mask the pain in severe cases. Provides Long-Lasting Results – Hip arthroplasty offers long-term results. Other treatments like pain relievers or physical therapy only work as long as the treatment is taken or performed regularly and once the treatment stops, the symptoms return. In many cases, these treatments offer temporary relief while symptoms continue to worsen over time. Hip arthroplasty is different. Once the procedure is done, results can last for many years. 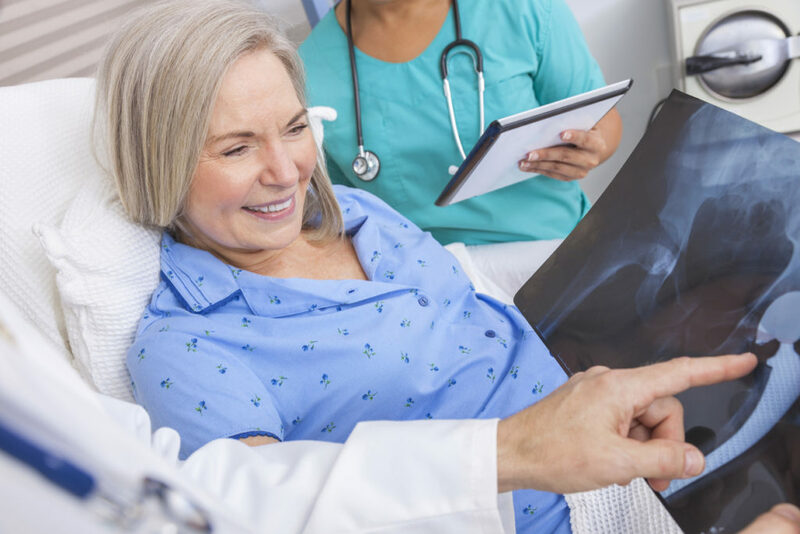 If are interested in learning about hip joint replacement (arthroplasty) and whether it’s the right treatment decision for you, Orthopaedic Associates of Central Maryland would love to meet with you. They have a wealth of knowledge and experience diagnosing and treating hip and other orthopedic problems. Call (410) 644-1880 to make an appointment today.